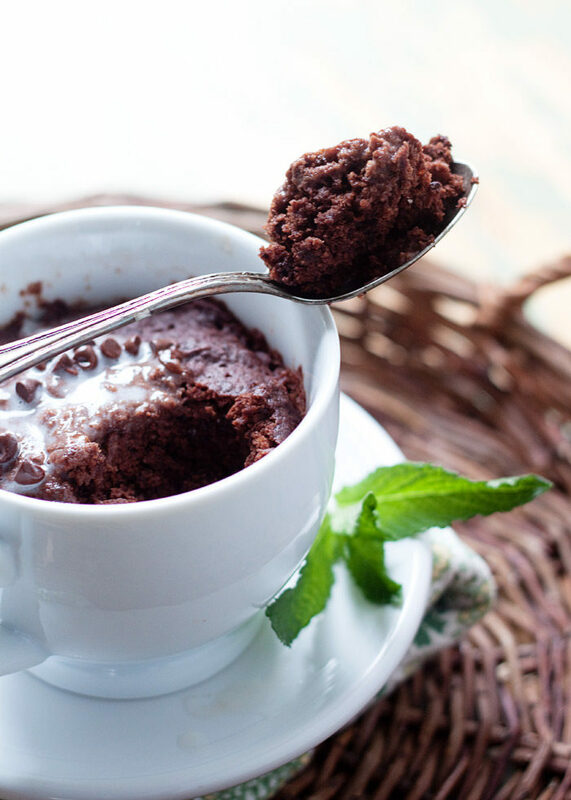 This uber-chocolatey mug cake just happens to be vegan, but everyone is sure to appreciate this decadent little indulgence. Now that I’m in my 40s and a mom to boot, I feel like I’m on the fast path to lame. Maybe I’m already here. Actually … I have a sneaking suspicion I’ve been here for awhile. After all, I grew tired of the bar scene right about the same time I hit legal drinking age (ahem) – and that was over half a lifetime ago. A few months ago, I was out with some preschool moms, and we managed to stay out until midnight. I came home, woke my guy, and practically did a happy dance at the foot of the bed – so proud was I for staying out so late. In his sleepy haze, he didn’t really appreciate the high-five requests. Yeah … I still high-five. The truth is, more often than not, my guy and I are in bed by 8:30 p.m. I mean, we really have transformed into morning people (parenthood helped), so I try to justify our elderly bedtime. I mean, I do generally wake between 4 – 5 a.m. and work for a couple of hours. The house is so quiet! I do my best work then! On the flip side, by 6 p.m., my brain has officially shut down. So, as you can imagine, a wild night packed full of green beers and Irish jigs and rad t-shirts is not exactly on our agenda for Saint Patrick’s Day. Preschool crafts, yes. Maybe some green mac and cheese. 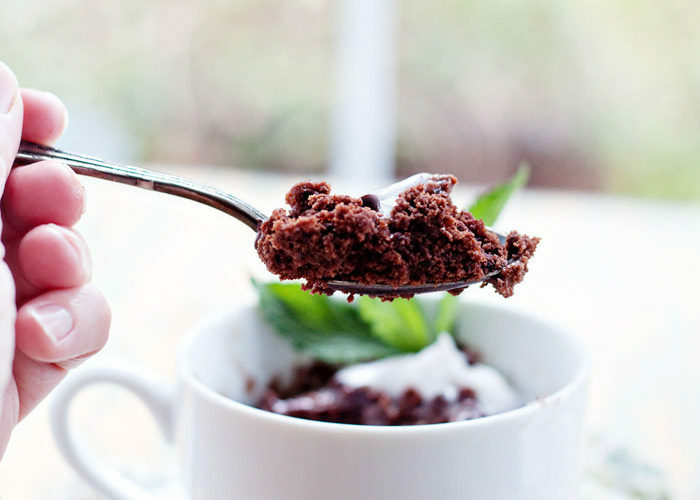 And I can even manage this mug cake after 6 in the evening, because it’s darn near the easiest thing to make, ever. (Well, aside from this one, which is even easier.) Plus, chocolate. Mug cakes are both dangerous and awesome. They’re so easy to make – cake in an instant! So it’s kind of hazardous thing to have in your cooking arsenal. But they’re also great for eating sweets in moderation. 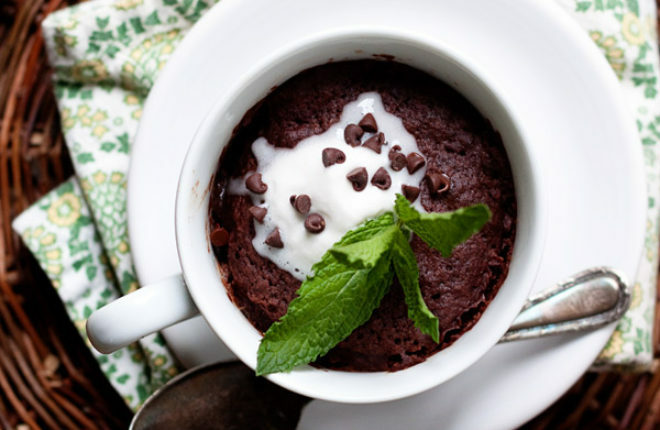 This Vegan Double Chocolate Mint Mug Cake is an indulgence, yes. But when that single serving is gone, it’s gone. No tempting half-rounds of cake beckoning me from the kitchen. That’s the awesome part – at least, when I’m counting calories (which I perpetually am). 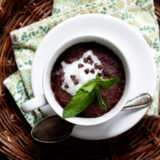 This mug cake is uber-chocolatey with both actual chocolate melted in plus cocoa powder to boot. Hence the “double!” It’s moist with a nice crumb, and absolutely otherworldly with a dollop of vanilla-touched coconut whipped cream. I mean, otherworldly for a mug cake. Would a non-lame person ever describe a mug cake as “otherworldly?” Yeah … don’t answer that. 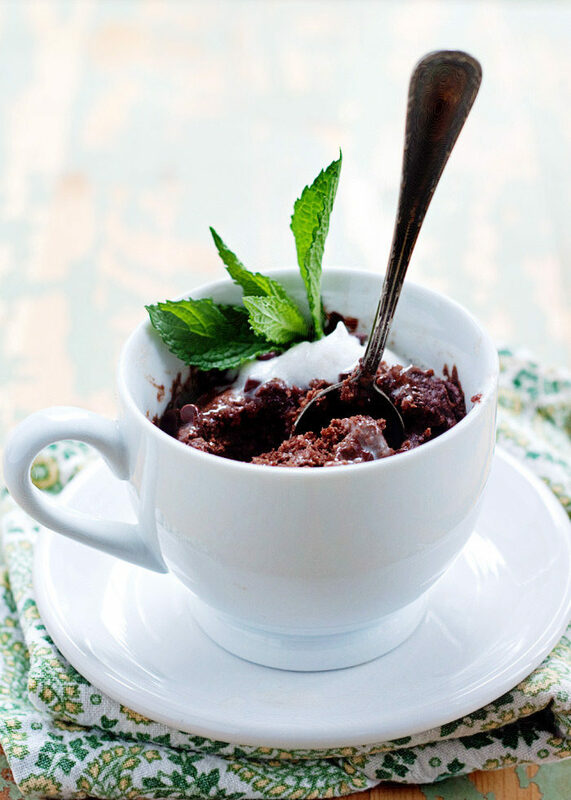 Place the chocolate and the coconut oil into a microwave-proof mug. Microwave at 50% power for 30 seconds and stir. If the chocolate is not yet melted, microwave again at 50% power in 15-second increments, stirring each time, until the chocolate is melted. It usually takes me about one minute total. Add the remaining ingredients except optional toppings. Stir with a fork until combined. Microwave on high until risen and just until dry to the touch, 1-2 minutes (in my microwave it takes 1 minute 15 seconds). Add toppings if you like and serve. Use your favorite gluten-free flour blend.